Also known as a mound or clump. Here, the stems all tend to arise from one central point. They may have an upright V-shaped habit, often with the flowers being displayed above the foliage. Some types are more mounding in habit. Tuft-shaped alpines often die back during the winter, and the types that do this will need to be cut back in late fall or early spring before the new growth resumes. Most tuft-shaped alpines must be increased by division of the whole clump, by cuttings or by seed. They also are suitable for medium to large groupings. In an alpine trough or container, one or two tufted plants provide some much-needed bushiness and height. 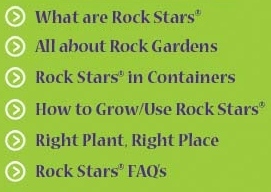 To see different Rock Stars® with a tufted habit, try using our Advanced Search to locate them quickly and easily.